I love street food, period. 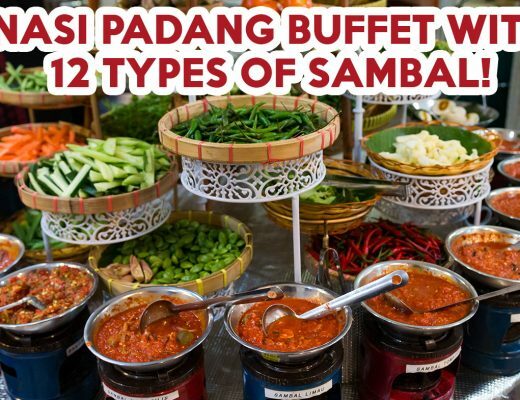 Pasar malams are my favourite, but it’s not always easy to find one, and it’s a little sian that there’s nowhere to sit and eat my food. 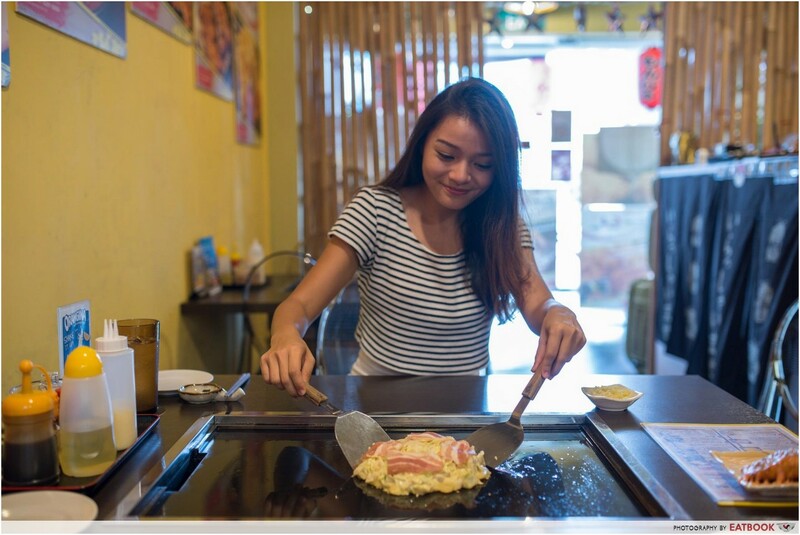 So Seiwaa Okonomiyaki & Teppanyaki Restaurant at Dunlop Street definitely made it to my list of best finds this week. 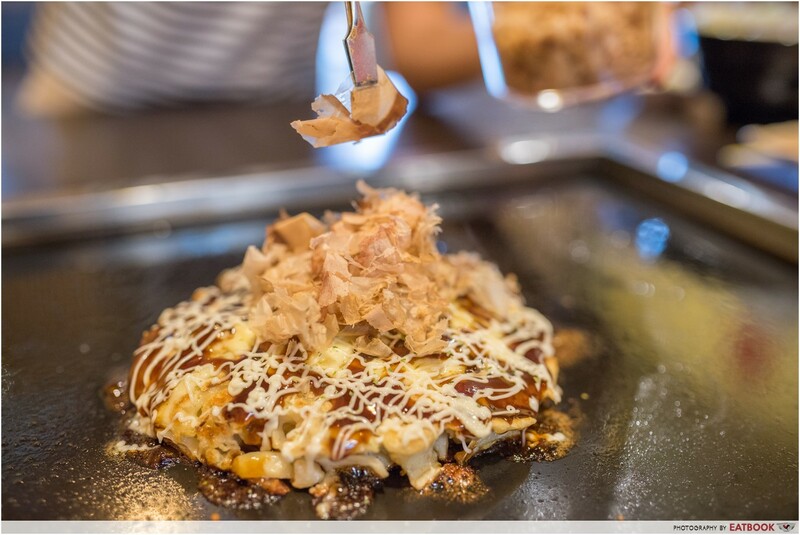 It’s got an elevated version of my must-have pasar malam item, okonomiyaki, but at a comfortable restaurant – YAY! What’s cool is I can even cook the Japanese pancake myself with a grill on my table. 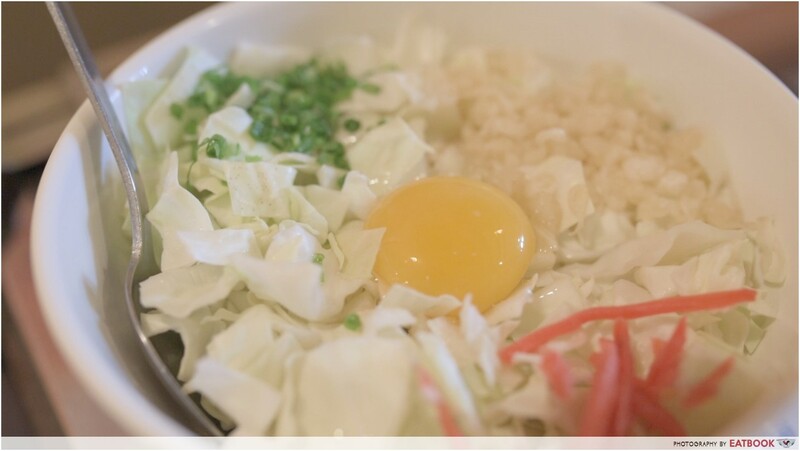 Seiwaa’s signature dishes are okonomiyaki and monjayaki. 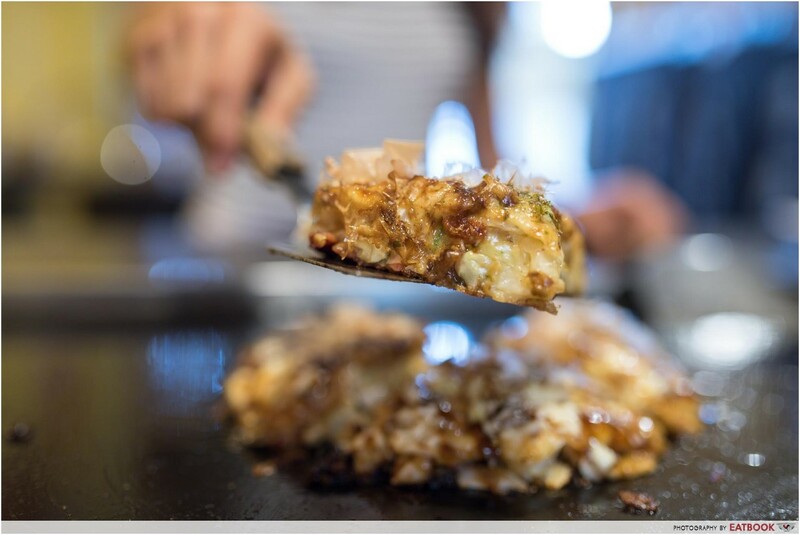 Think of monjayaki as a bigger and flatter version of okonomiyaki, and grilled only on one side to create contrasting textures. It’s tough to make a decision on which to order so I suggest getting BOTH. As if having a Japanese chef cook right before your eyes isn’t cool enough, you can unleash your inner Masterchef and cook it yourself. 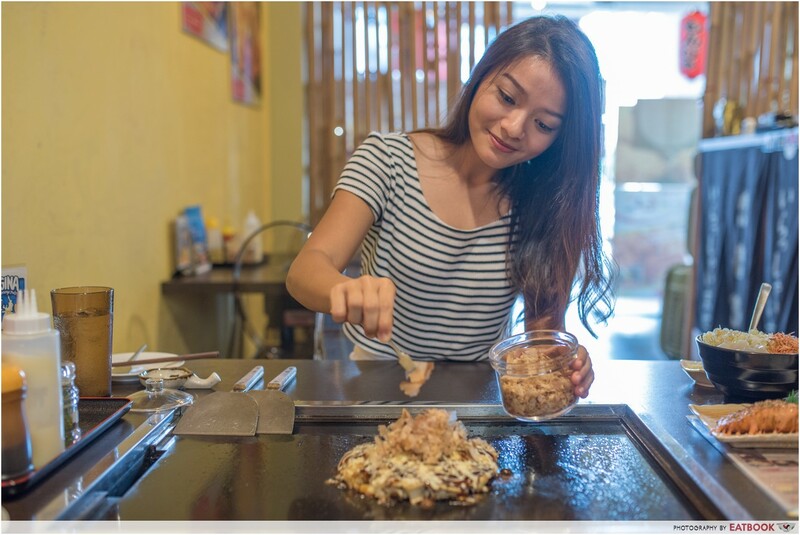 *rolls up sleeves* I’ve never tried making an okonomiyaki before so if you’re just like me, don’t worry, a step-by-step guide provided by the restaurant will be of great help. Our Pork Okonomiyaki ($10+) arrived with a bowl of cabbage, raw egg, carrots and spring onions seated on top of okonomiyaki batter and a plate of bacon. There were several additional toppings available and we chose cheese (+$3) because, let’s be real, cheese and bae-con together are #goals. First step, mix the okonomiyaki batter real good. Then pour it onto the grill and form a round shape. Once you’re done with that, add slices of bacon on top. Next will be the toughest part, which is to WAIT. Just kidding, the real challenge is to FLIP the okonomiyaki and make sure it survives that flip in one piece. While it was cooking on the other side, we added our mozzarella cheese topping. 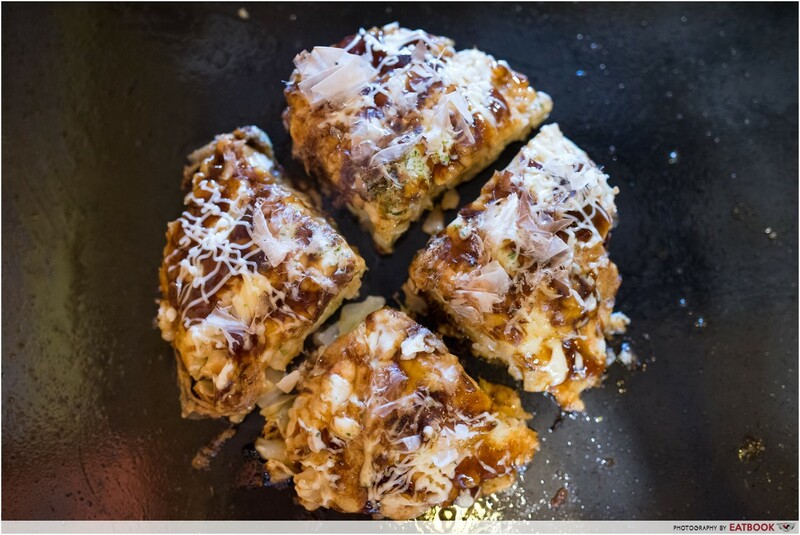 The last step is to drizzle a generous amount of okonomiyaki sauce and Japanese mayonnaise right on top and finish off with a sprinkle of seaweed and a pile of katsuobushi (dried bonito flakes). I thought the batter was too little as compared to the cabbage. 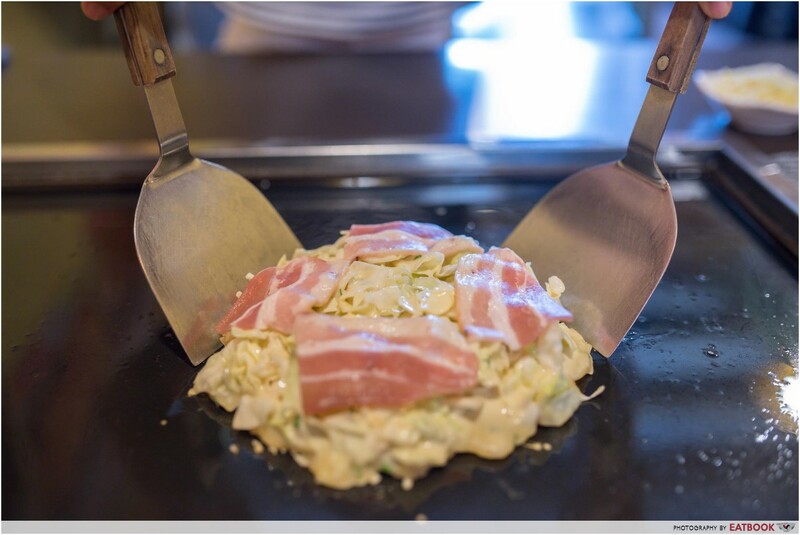 But it was just enough to give this okonomiyaki a fluffy and chewy texture without neglecting the crispy bacon and crunchy cabbage. 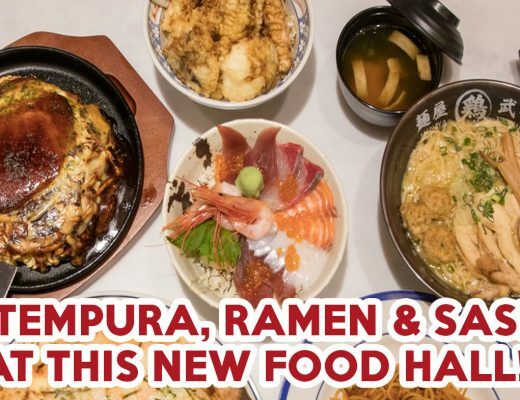 The sauce combo was a sure win – the okonomiyaki sauce was sweet with a hint of savouriness while the Japanese mayonnaise was creamy and rich. This was actually more filling than expected! Next up, Seafood Monjayaki ($10+). I decided to hand over my spatulas to the Japanese chef because I’ve never tried a monjayaki before and cooking this dish requires more skill. Be wowed watching the chef getting into action! 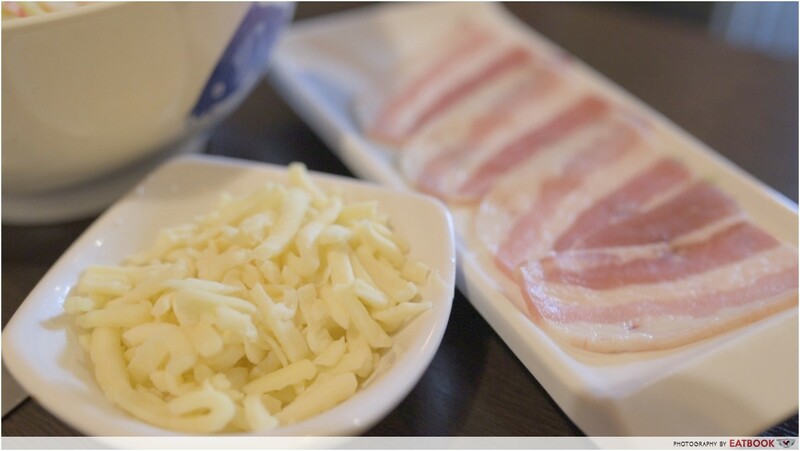 We added cheese (+$3) to monjayaki as well but the portion of mozzarella cheese given was too little. If you’re willing to splurge a little, I suggest getting double portion of cheese or other toppings such as mentaiko (+$5) or even mochi (+$3). 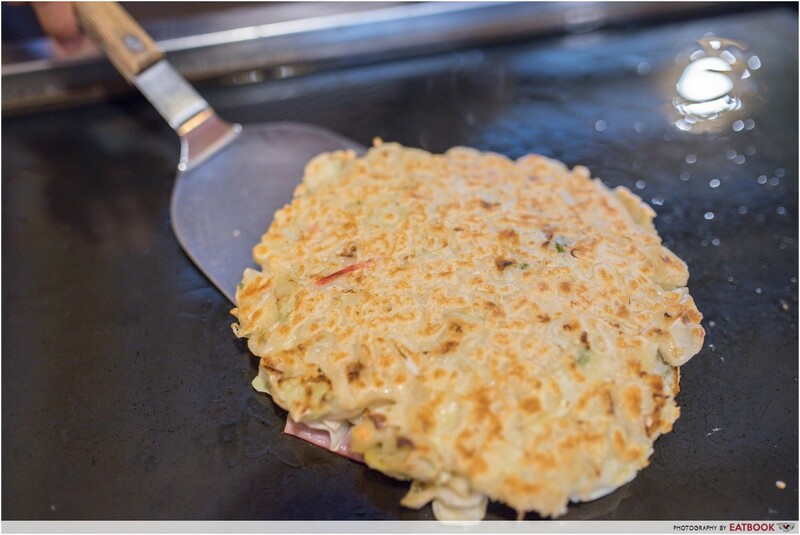 While okonomiyaki is thick and fluffy, monjayaki is crispy on the bottom and slightly undercooked on the surface because it’s only grilled on one side. The right way to eat a monjayaki is to scrape it with a mini metal spatula and eat right off the grill. 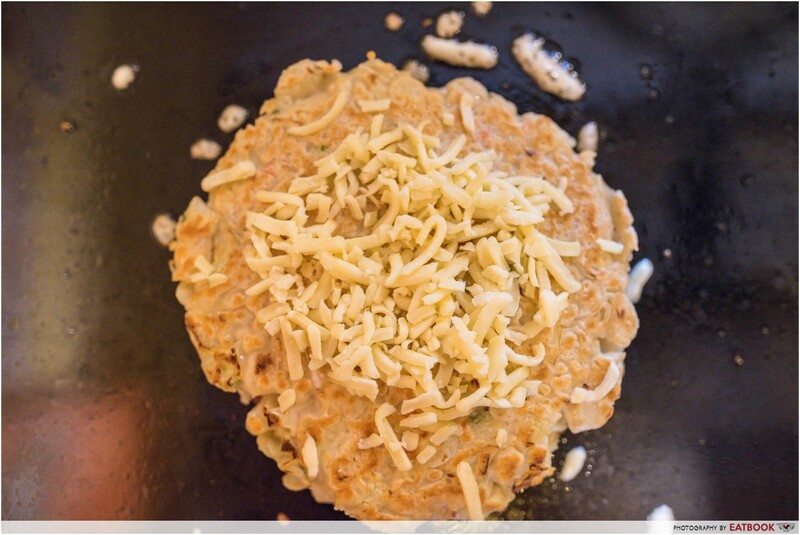 Though monjayaki is considered a pancake, it tastes nothing like one. The crispy part was extremely fragrant while the undercooked surface was savoury with a texture of a thick sauce, similar to the gravy used in horfun. The highlight of the dish was the ingredients. The bits and pieces of squid and prawn were firm and sweet in their natural tastes. 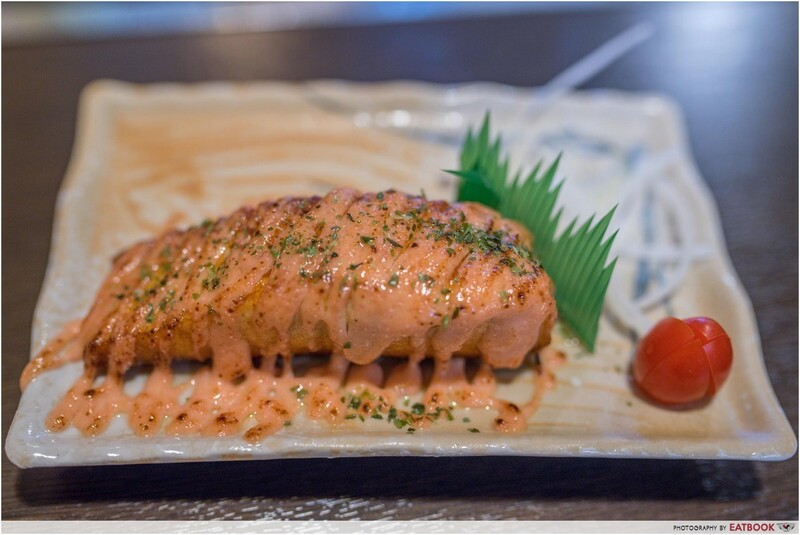 As okonomiyaki and monjayaki take some time to cook, I ordered Aburi Mentai Salmon ($18+) to tame my growling belly. Second to the love of my life, salted egg yolk, is mentaiko. The mentaiko drizzled on the salmon was full of that familiar briny and savoury flavour, but I wish there could have been more of it. The salmon was overcooked but I wiped this plate clean anyway because of the mentaiko. 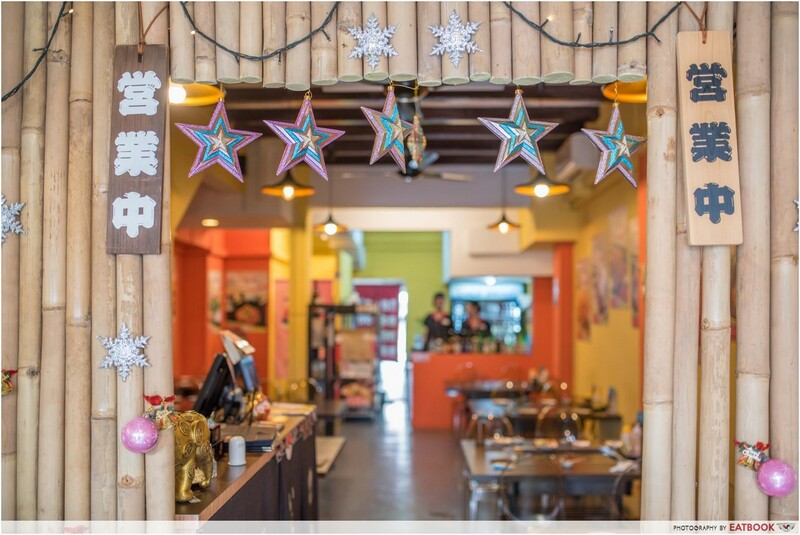 With simple Japanese decoration and a teppanyaki grill on every table, Seiwaa was really cosy and comfortable to dine at. But they don’t have the best ventilation so expect the smell of food to linger on you. Also, the restaurant is pretty small so early to chope a table. 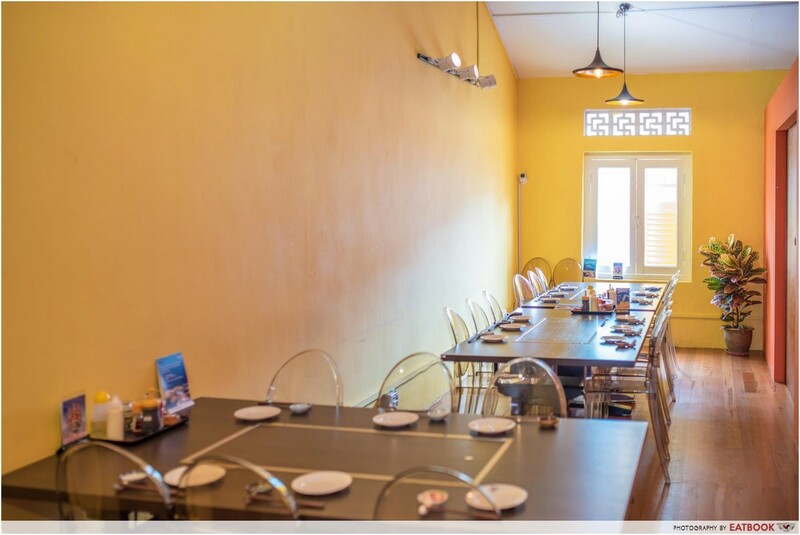 If you’re planning to come in a big group or plan a birthday celebration, don’t worry, they have more space on the second floor. Just be sure to reserve a table before heading down. I have always been that little kid who squeezes through the crowd and presses her face against the glass at restaurants to catch chefs in action. So being able to make my own okonomiyaki was really enjoyable for me. 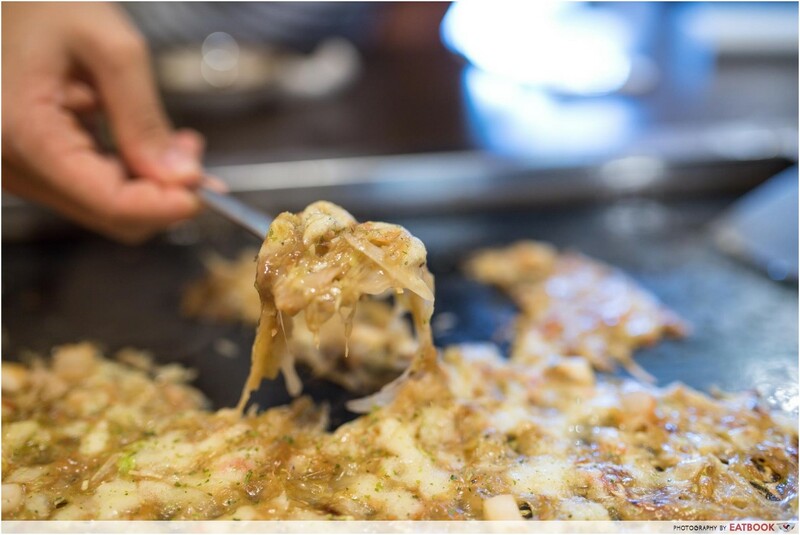 While you can definitely find a cheaper okonomiyaki elsewhere, I’d pay for the fun. As with anything D-I-Y, epic moments are bound to happen! 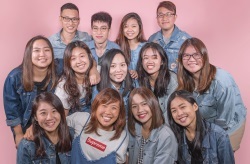 I definitely recommend bringing your friends along for a great night out. If it involves spices, challenges or coffee - I'm in.